Covenant group ministry session plans, with hands-on activities for participants. Following the Evensong model of worship for small groups, this program provides a supportive group setting for men. The 8 worship gatherings are 120 minutes long and include singing, reading and discussion suggestions. The 64-page booklet is designed to be used by leaders and participants. Bushman has led men's groups for over 25 years and Hamilton-Holway is co-minister at the Unitarian Universalist Church in Berkeley, CA. Gatherings is a ritualized series of eight small-group worship services offering men an opportunity to grow spiritually and personally by meeting in an atmosphere of appreciation, attentive listening, and self-discovery. Through shared leadership and participation, Gatherings nurtures a culture of trust and support. Over the many years that we have been doing pastoral work, both with individuals and in support groups, we have found that certain issues continually arise among men. We have also found that men often feel most secure talking about these issues when they are sharing them with other men because there is a feeling of common experience and understanding. This program is designed to provide an outlet for men to explore together what it means to be men and to give and receive support. Respect, safety, and mutual regard grow as men share their experiences, feelings, doubts, and hopes. Although an individual may lead a Gatherings program, we recommend co-leaders. Sharing this role models mutuality and enables each leader, at times, to step back and observe the group dynamics. Sharing leadership is easier, less risky, more flexible, and more fun than working alone. While choosing leaders with experience in group facilitation is recommended, inexperienced leaders can be successful simply by following the orders of service and reading the suggestions for leaders at the end of this book. Participants may wish to continue meeting beyond the eight gatherings, with a new team assuming responsibility for leadership. Some participants may have babysitters at home or early morning commitments. It is important to honor the two-hour schedule for the gathering, beginning and ending on time. If time is running out in any gathering, the group may decide to go beyond the closing time, but only if all participants agree. Regular attendance makes for a strong group. If you know you will miss a meeting, let the leader or another member of the group know in advance. At the end of this book, you will find exercises that form the basis for Communing at each gathering. The preparation time is usually about twenty minutes. Preparing in advance by writing or drawing your responses to the questions eliminates the need to do the preparatory exercises during the meeting and maximizes the time available for sharing. Your group may use a buddy system to encourage completion of exercises and nurture the development of relationships among participants. Your group may begin each gathering by talking through the Order of Service. Some of you may volunteer to lead different parts as you move through the services. Each Order of Service contains the following elements: a Chalice Lighting, Opening Words, two songs, Sharing Joys and Sorrows, readings, a period of silence, Communing, sharing feelings or appreciations, and Closing Words. There is no more crucial concern, nay imperative, in Unitarian Universalist congregational life, than feeding the souls of men. Bushman and Hamilton-Holway know this and have furnished a varied and tasty fare. A small group ministry specifically geared to assuage men's deeper hungers will strengthen our entire liberal religious enterprise. Everyone and everything benefits when our men are properly nourished. 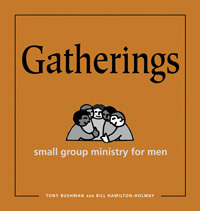 Gatherings is a much-needed, long-awaited, and tremendously valuable resource for UU men. It will help UU men of all ages connect with one another and themselves.